Anne MacCaffrey’s Dragonriders of Pern details the effects of an advanced civilization that loses its technological edge due to nature’s unstoppable force. Jean Auel’s Clan of the Cave Bear offers rich details of the Upper Paleolithic era. 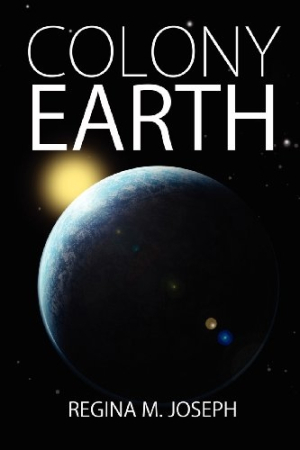 In Colony Earth, Regina M. Joseph blends the two worlds of science fiction and anthropology in an enjoyable tale that attempts to explain how humankind exploded in knowledge after the last Ice Age. Lil has been groomed for centuries to become the next supreme leader of Alterran society. As part of his training—and his punishment—he is sent to the far colony of Earth. Inculcated with the strict rules and regulations of “the Party of Harmony and Stability,” he is almost too proper to make the necessary changes that will allow his band of men to survive on primitive Earth after Alterra collapses. What begins as a minor crisis turns into a major disaster, however, after a comet destroys their technology and forces them to turn to the Earth for survival. Lil is highly believable when he doubts his ability to do what is best for his starving men while still trying to balance his loyalties to his Alterran upbringing. At times, he seems unreasonable or overbearing, but he exhibits thoroughly human qualities, even going so far as to offer comfort and assistance to a beautiful Earth woman despite the non-interference rule. Lil’s acts of compassion and reason are what move this story along, creating a slippery slope of consequences that push him and his men further and further away from their original purpose. Sure, learning to hunt and eat meat seems reasonable when there’s no time to learn to cultivate crops, but vegetarianism is a cornerstone of Harmony and Stability. And when their race seems doomed for lack of children, it is only logical for Lil to propose that his men marry the Earth women. Such ideas, however, are contrary to everything Lil’s father and the Council stand for. Without being preachy or bogging down the action of the story, Joseph does an admirable job of weaving social themes into her adventure scenes. Although this is ultimately a survival story, readers are invited to ponder the quality of a life without individual choice and to consider how those choices can lead to a strengthened sense of community or even war. Themes of slavery are woven through the chapters: slavery to other humans as well as slavery to ancient traditions. Family loyalties are tested, too, as is the assumption that humanity can reach a social peak in which further perfection is no longer required. High in technical credibility, this story will captivate fans who appreciate the complexities of building—and then destroying—a believable utopia. Despite a slow beginning and several chunks of too much backstory, this novel is filled with cliffhanger chapters and well-timed surprises, making it hard to predict what will happen next. In fact, the whole story gallops toward Lil’s ultimate decision, even going so far as to set up loose ends that will, no doubt, be explained in the next part of this trilogy. Colony Earth is a worthwhile read for anyone who enjoys thinking about the challenges to be faced in rebuilding a new society.